at one of our favorite sites Truly Engaging Blog by the awesome Heidi!!! 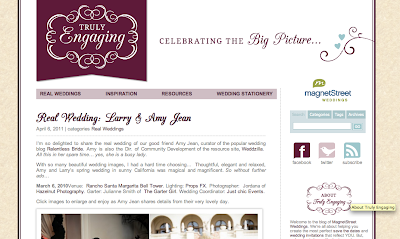 Be sure to check out the post and leave a comment ... and don't just check out our Real Wedding, Truly Engaging blog highlights a lot of other Real Weddings as well as is a great resource for you brides and grooms for wedding planning! Congrats on the feature, AmyJean! Happy Belated! Hope your anniversary was filled with amazement and love! Cheers, to you and Husband and to many many more happy years!